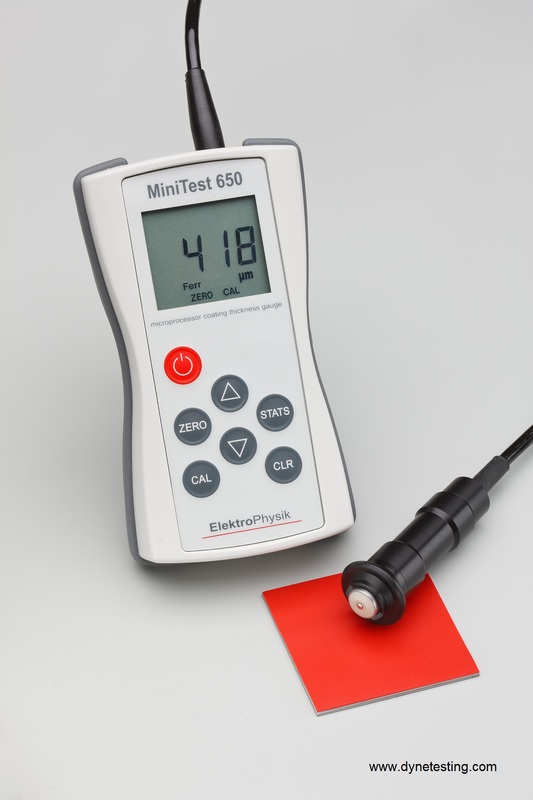 The MiniTest 650 is a rugged coating thickness gauge with a fixed external probe for all non-magnetic coatings on steel and all insulating coatings on non-ferrous metals. The instrument is particularly suited to measure coating thickness in rough environments and on abrasive surfaces for example sandblasted steel, heavy duty corrosion protection in ship building, at offshore installations and mining facilities and also on plasma-sprayed surfaces. The instrument is available in 3 model options: F, N and FN with fixed universal probe offering automatic substrate identification for quick measurements and is ideal for measuring coatings with a thickness of up to 2 and 3 mm. Scope of Delivery: Gauge MiniTest 650 with fixed probe, 3 batteries AAA / LR03 / Micro, Control plate(s), calibration standards in folding case, Operating manual on a CD, Quick reference guide, Factory certification, Soft case. To measure non-magnetic coatings (varnishes, enamels, chromium etc.) on ferromagnetic substrates (e.g. steel used in construction and for auto body). Measuring range 0 to 3 mm. Interchangeable measuring units µm or mils. To measure insulating coatings (varnishes, enamels, anodic coatings etc.) on non-ferrous metals (aluminium, copper, brass etc.). Measuring range 0 to 2 mm. To measure non-magnetic coatings (varnishes, enamels etc.) on ferromagnetic substrates (e.g. steel used in construction and for auto body) and to measure insulating coatings (varnishes, enamels, anodic coatings etc.) on non-ferrous metals (aluminium, copper, brass etc. ).